Skippered yacht charter is a halfway-house between bareboats and crewed yachts (and should not be confused with the latter — see crewed yachts for the distinction). Bareboat & “Skippered” yacht charters utilise the same boats, simply with or without a professional skipper. The running maintenance is the skipper’s responsibility and he (or occasionally, she) will organise whatever needs attention. 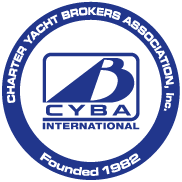 However, as with bareboats, you should still inspect the yacht, in so far as you are able to, before embarking. Skipper and charterer need to get along pretty well for this type of charter to be successful. Fortunately, most professional skippers are relaxed and easy-going, some are positive diplomats; they have to get along with everyone. Just remember the skipper is responsible for the safety of the yacht and those aboard, so in this respect the skipper is in charge. Bear this in mind when discussing where to go, what to do and when. Spending an afternoon swimming before setting out for a port twenty miles distant may be impractical if it means arriving in the dark. Being set on a destination which, today, happens to be upwind and it’s blowing 30 knots may be possible, if uncomfortable. Talking it over with your skipper first can save misunderstandings and disappointments later. Bear in mind the skipper’s native language may not be your own, so making sure everyone understands the same thing is all part of the adventure in a foreign land. What if it doesn’t work out this way? Fortunately, it’s rare, but if you just don’t get along with your skipper and you can’t see eye to eye, tell the yacht operator and request a replacement skipper – the practicality of which may be determined by how far from base you are. And if it works out fine? You may not immediately realise it, but very few professional skippers are actually employed by the operator whose yacht you are sailing on. Most are freelancers, without any kind of job security, whose continuing livelihood is dictated by how good they are at their job and, basically, their reputation. Conflicts are uncommon, the reverse is usually the case as they do the job because they love it, not for the money. If you’re satisfied at the end, give the skipper a handsome tip, it’s no doubt been earned.